We do hope that you have already had a chance to try out the SEMrush Filtering for Domain, Organic, and Ads keywords feature and that you found it handy to edit these reports directly and specify the results that you want to show. We have gone even further to make your work with SEMrush more simple and advantageous. Now filters are also available for Phrase Match Keywords and Related Keywords Reports making it easy for you to obtain required results with all parameters available for this type of report: keyword/volume/CPC/competition/results. 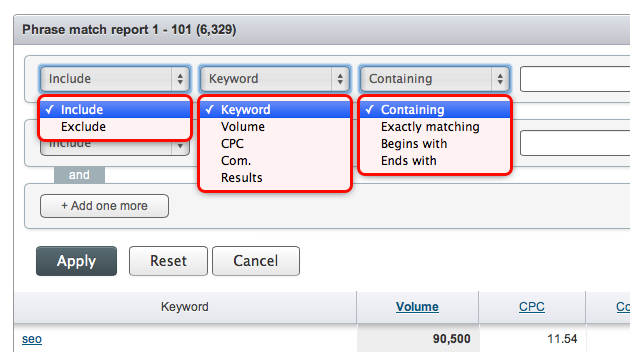 Moreover, the keywords within the report are now sortable for 4 columns: volume, CPC, competition, and results. So go on and enjoy this remarkable new feature! We are always inspired in realizing that you find SEMrush to be such a beneficial tool and will continue to find ways to make it even more useful and exciting! Go Ahead and Test out our Innovative Competitors Discovery Report. You Know You Want to!